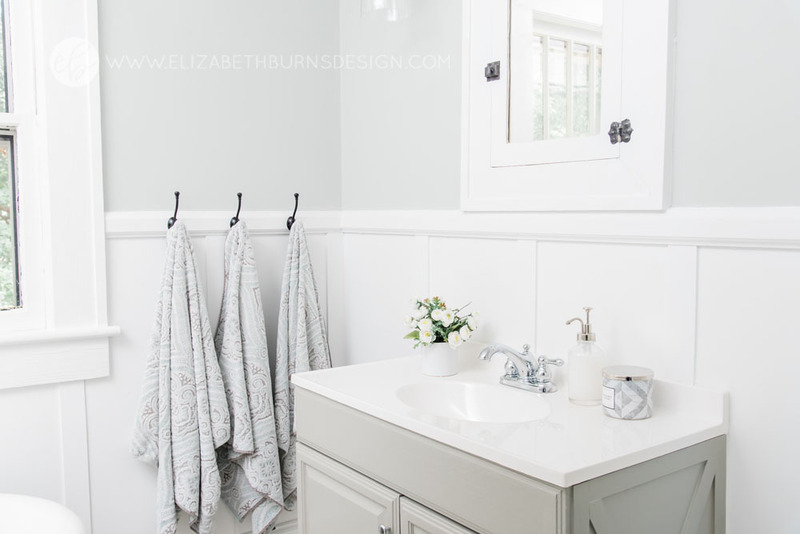 One of my absolute favorite projects from this whole renovation was the vanity makeover. We found this vanity on clearance at Lowe's for $90. Honestly, it was very similar in color to the one in the before photos! Most vanities are 21-22" deep and since the door opening only leaves 20" of clearance, I needed something narrow. This oak one fit the bill at 18.5" deep so we added an "x" detail on the ends to create some visual interest. 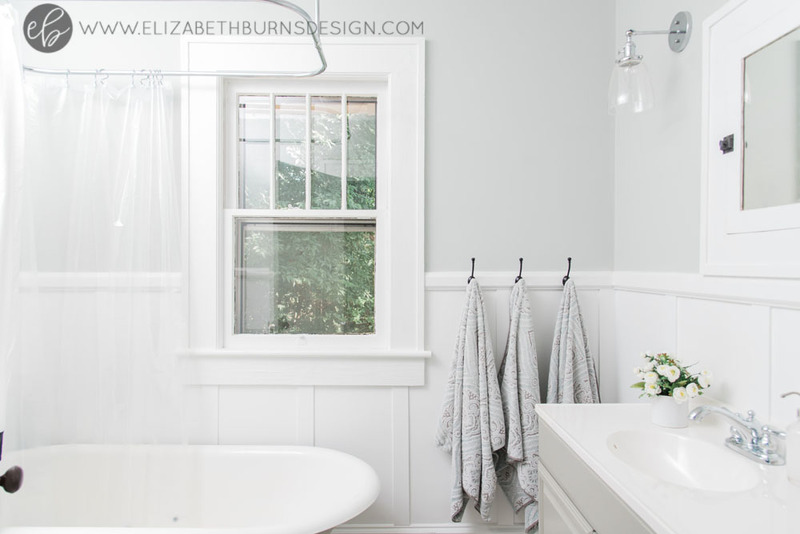 I used some leftover Sherwin Williams Intellectual Gray paint and I LOVE how it turned out. For less than $115 we have a beautiful vanity with plenty of storage and countertop space. There was already a high chair rail in place and it seemed like the perfect area to add wainscoting. I figured the white paint would help brighten up this smallish bathroom and I think it was $60 well spent! The battens did take a little while to cut, install, and caulk, but I think it is little details like this that make a flip unique and stand out in buyers' minds. 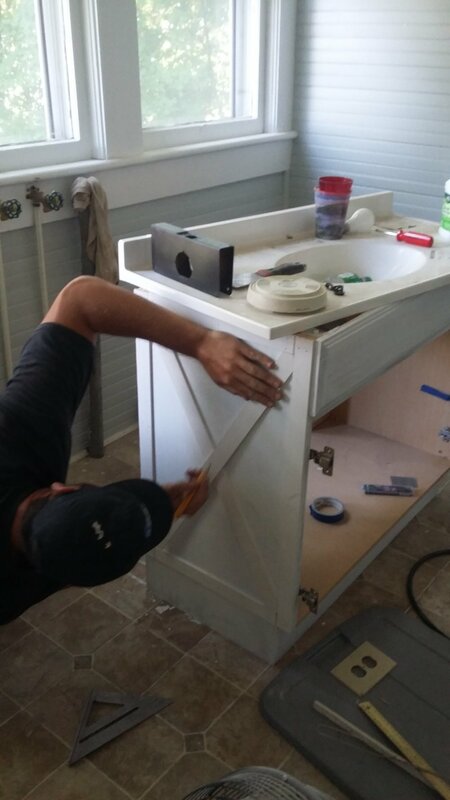 We were also able to bring out some original character by painting the cute medicine cabinet. The oil rubbed bronze hinges draw the eye to the mirror and highlight the original hardware. I'm pretty sure having no shower in a house would be a deal breaker for most buyers. After some research, we ended up with this clawfoot tub shower converter kit from Home Depot. There were some cheaper versions on Ebay, but I wanted to make sure I could quickly return the kit if it didn't work. It was a little cumbersome to put together (definitely a two man/woman task) and a little flimsy, but it gets the job done! We wanted to add an upgraded shower head, but the kit does not have a standard size valve so we scratched that idea. We also painted the exterior of the tub the same color as the vanity (Sherwin Williams Intellectual Gray) and the claw feet were spray painted oil rubbed bronze. I think the tub cleaned up really well! We added a new toilet and toilet paper holder to complete the bathroom. 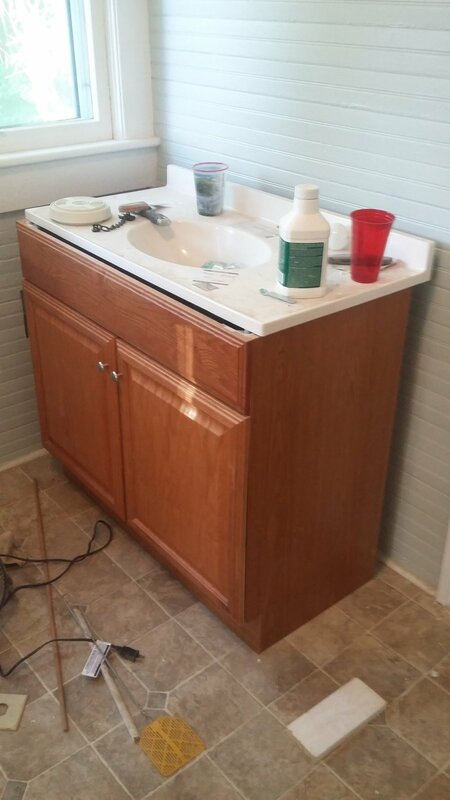 We probably could have gotten away with the same toilet, but to me a new toilet is an inexpensive way to make the overall bathroom feel sparkly and new, especially since we had to remove it to install the new floor. You can see the wainscoting detail a little bit better in the above photo. 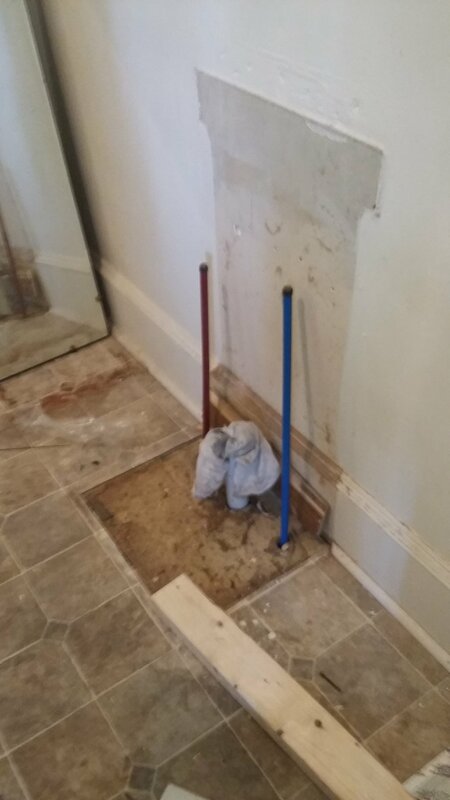 We had to use 1/4" thick battens so that they weren't thicker than the baseboard. If starting a wainscoting project from scratch, I'd probably go with something a little thicker like 1/2" or even 1". Believe it or not, we scored this pretty faucet from the Habitat Restore! It was only $45 (brand new) and I think it added a nice touch to the bathroom. I try to get decent quality plumbing fixtures for flips because they are something that get a lot of use and that you don't want to skimp on. I don't think I'll ever install another towel bar in a house ever again! Towel hooks are so much more practical and save a ton of space. How pretty are these oil-rubbed bronze hooks from DLawless Hardware? They are only $1.97 each and are SUPER sturdy. I will definitely be using these again for other projects. The dark finish ties in the medicine cabinet hardware, claw foot tub feet, and original door hardware in the bathroom.